Leading the pack with fun, outgoing and inspirational suits, the Dolfin Uglies have done it again. Get the most out of your practices with a suit that holds up as well as you do. 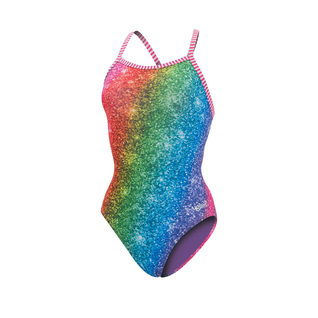 The all new Dolfin Uglies OVER THE RAINBOW V-2 Back Female is fully lined in bright contrasting colors that will keep their color through many hours of training.